Pepe Hernandez’ traveling circus may just be a posse of cast off children from his prior 5 marriages, he may have lost a few 3-ring trained animals while crossing the Mohave Desert, to heat stroke and lack of rations, yes the chupacabra is voraciously hungry, messy and running wild around town shredding costumes, tents and car paint in its wake, the choreography awkward, the acts inconsistent and the talent decidedly second-rate. Then there’s the problem with 15-year-old “mui fuerte” Maria begging, flirting and falling in love with male guests for a green card in exchange for cooking, cleaning and a little something extra. Kittenish half-Swedish blonde bombshell Consuelo is suggestively (but oh so politely in front of the wives in attendance) inviting potential male agents back stage to talk about representation. Never mind the half-wit drums, piano and accordion playing boys who can’t get anything right — although they try, they really, really try. 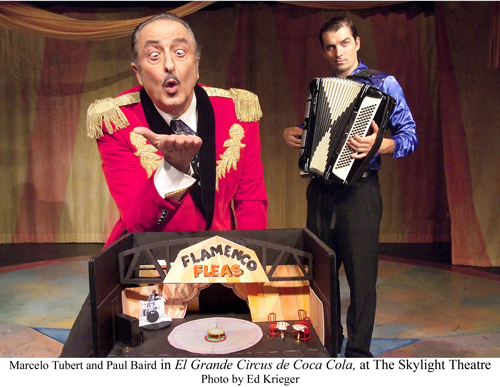 El Grande Circus de Coca Cola Skylight Theatre is the most inconceivable Spanish language only, spectacular “spectacular”, everything but the kitchen sink carnival motif revival, to play Hollywood Boulevard in as far back as probably anyone can remember. Film aficionado Pepe Hernandez has finally arrived on a world tour, in Hollywood at the Skylight Theatre, bringing with him an almost razzle-dazzle mashup of variety show acts including knife throwing, magic tricks, fortune-telling, opera, ballet, a fearsome parody of Latino telenovela and a coup de gras performance of Las Flamenco Fleas from Barcelona..
Click the FootLights cover for the program notes. This show, with all its holes and dragging lulls in between all the “jazz” is so incredibly creative, so high-caliber designed, so astounding in performance there’s no way you won’t want to stay till the end! The absolute highlights are the team-choreographed commercials made for their sponsor, American soda company, Coca Cola. The final histrionic stunner however is the photographic replay of Pepe’s girls’ Quinceañera, a bona fide study in perfect physical comedy. El Grande Circus de Coca Cola is a beautiful, colorful, glitterized, 80 minutes mess!